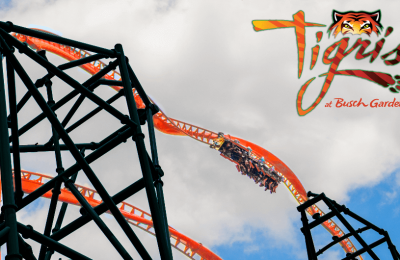 Behind The Thrills | Huge BGT update: Katonga, Kumba, Project 2011 and more! Huge BGT update: Katonga, Kumba, Project 2011 and more! Huge BGT update: Katonga, Kumba, Project 2011 and more! My Dad came down for the weekend, so we decided to get out of the house and head to Busch Gardens and Seaworld over the weekend. There’s tons going on at Busch Gardens.. And when I say tons, I mean it! Project 2011 looks like it’s well underway, Kumba is down for painting, and Katonga is leaving soon, so my Dad and I saw it for the first time. Sad to see it’s leaving because I really liked it, but that leaves room for something better to replace it. The train is still down at BGT for the construction going on. Next to the Skyride they’ve got one of those.. poundy things that pounds pipes into the ground, but it wasn’t operating while the park was open. It looks as if they are digging out a trench near the skyride and train station, but they’ve got some cement blocks going up in that area in an “L” shape. It could possibly be an underground habitat for the animals. While the train is down for all this construction going on, there’s no better time to give Kumba a fresh paint job. 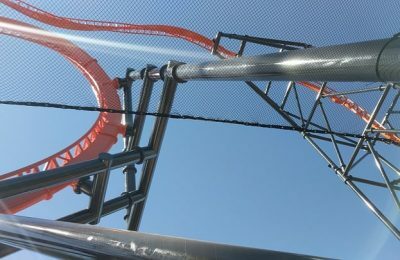 Anyone remember how the rails were all rusty and funky looking? The rails are getting a nice teal coat. It looks great! Can’t wait to see what Kumba actually looks like when they’re done painting. After Hauntcon happened a few weeks ago and our reporter was able to grab some DED merchandise, we’ve been wondering if DED will be returning for a second year of it the house will be getting a complete makeover for HOS 2010. The wall at the exit for Tidal Wave has been removed and a green wall is visible. Obviously, it’s been blocked off so we can’t see what’s going on, but the lighthouse has been removed. Speaking of Howl-o-Scream, we’ve heard rumors of a new building going up in the Gwazi Park area. There’s a whole bunch of boxes covered with tarps in the area.. 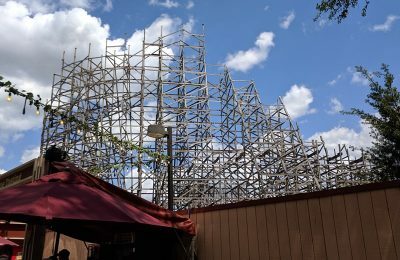 There is also some construction visible from Skeikra if you turn your head really hard to the left. It’s possible that it’s stuff from LOD they’re trying to protect before it gets shipped up to Williamsburg, or its stuff for 13, or the construction going on. Busch Gardens confirmed a few weeks ago that Katonga will officially be leaving the park labor day weekend. While it’s sad to see Katonga go, that leaves room for something better to replace it. I saw Katonga for the first time yesterday and I liked it. It’s a unique show and the costumes seem a bit outdated, but it’s a must see before it’s gone forever. Lots of stuff was happening in the park yesterday. Yesterday (May 16th) was Montu’s 14th birthday. Now most people would shrug it off as just another day, but the staff at Montu actually celebrated the event. It showed a lot of pride in their jobs, and made it that much more fun. I tried out their text messaging service to get random tips, ride wait times, and promos. The park sends out ride waits times one an hour, and they’re pretty accurate. We only came across one ride that had a different wait time than the text messages listed, but the wait was actually shorter than what my phone said. Props to them for such a great tool for guests. When we arrived at the park, we came across what looked to be an employee putting out a fire in a trash can. Wouldn’t surprise me because I’ve seen people throw cigarettes in trash cans before. Tidal Wave also had to do an evacuation yesterday.. Right after we got off the ride. While it would have been neat to be walked down, it would have been time consuming. The ride was down for quite some time, but the park had it up and running shortly after. Tons is going on, so be sure to check back for more updates.